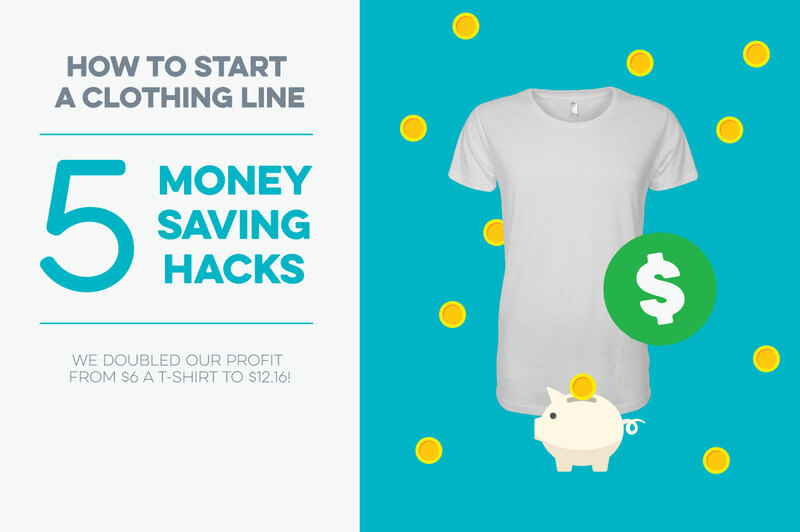 I’m going to teach you the 5 most important money saving hacks i’ve learnt to reducing your screen printing production costs when starting a clothing line or t-shirt business. These tips will ultimately make you more money. How much money can you make? In our real world examples (found towards the bottom of this post) by simply following these five tips we doubled our profit from $6 a t-shirt to $12.16! 5 money saving hacks to start a clothing line and not go broke. Screen printing factories actually make more money off supplying garments to their customers than they do on the silk screen setup and screen printing phase of production. Cut out the middleman, source your own garments. It can save you a lot of money. Every screen printing shop has a ‘per screen’ setup fee. It’s the fee to setup each screen required for the job, as you need a separate screen for every colour your design uses. For us, we’re located just outside Melbourne, Australia. Most print shops here charge around $50 to $60 per screen. As a graphic designer, I know how challenging it can be to limit your designs to just one color, however, when you’re in the startup stages of your clothing business and you get quoted a substantial amount of money just for setup costs, it can be a hard pill to swallow. Remember, just because you’re limiting yourself to one color doesn’t mean your designs have to be boring. Experiment with using halftone effects to get different levels of shading into your graphics. Inject some interest into your design with distressed (aged) textures, brush textures or display fonts. This is your opportunity as a designer to be a bit more creative and save money! Another trap I see startup clothing labels falling into is placing their logo on every visible angle on their garment. For example, you have a large center chest logo, a sleeve print and a neck hem print. There is no doubt that the shirt looks great and people will be able to identify your brand easier, but each additional print placement will earn you another, unwanted, setup fee. The exception to multiple screen setup fees, is when you’re printing in bulk. The overall fee is divided by the amount of garments getting printed. Usually, young businesses trying to establish their brands, tend to have smaller print runs though. See our costing example below, to see the effect of multiple colors and print locations on your profit margins. It’s important to note that if you choose to use bright colours (excluding white) on dark fabric, the colours are desaturated rendering them less intense. To combat this, screen printers will print your artwork in white first, (this is called an underbase) and then lay the color print on top. This can be a problem, because having to print an underbase requires another screen and will cost another screen setup fee. Use dark ink colors on light garments or White ink on dark garments. Many screen printing facilities consider artwork that is larger than a standard A3 size as being “oversize”, as the larger designs, coupled with print registration markings, usually require using bigger silkscreens and transparent film (know as positives). Oversize prints can yield added setup and print costs. We doubled our t-shirt profits, here’s the numbers. So taking all 5 tips listed above, we have created two real world examples below, with costs taken from real suppliers here in Australia (other countries may have cheaper garment and printing costs). Order Description: 20 Short Sleeve T-Shirts, One Colour (Black) Chest Print on White Garment. Order Description: Same as above, but with added second color to the initial chest design and a sleeve logo (only white). Between each example’s total cost, is a difference of $6.10, almost double the single colour print. If we were to sell our t-shirt for $19.95. We profit $12.21 per tee from the Example 1 and only $6.11 in the Example 2.